Creative, catchy and keyword-rich available domain names now can be found without squeezing out all your brain juice. Ever heard of 'two heads is better than one' saying? Now you can allow NameStall's digital brain to help you out and get more than doing it on your own. With our sophisticated and advanced domain naming tools, you can get hundreds of amazing names that you might not even have thought of. These domain tools are actually online naming application to assist you to generate a list of all possible website names for you to choose from. Below is a brief explanation on how our domain name generator works or how it can aid you. Domain names are the URL address name for a website. Many people need a domain when they want to launch or start a website or blog. A website can be for many uses from personal to business purposes. Many businesses are leveraging the internet as a channel to get a wider audience as well as to let more people to know about their businesses or services. However, it is not easy to get suitable website names which are available, even if you have a great business or website idea. No matter how much you innovate on names you always find that someone else has already taken it. So, then you are left with little choice but to take the help of a domain generator to create a domain name. Good domain names contain keywords that describe what their website is all about. Descriptions doesn't need to be in a sentence but two to three words can sufficiently give an idea to the person who is looking at your domain what the website is all about. Let's say your website is about bird cages then you may want to put the word bird or cage in your domain name. It is not necessary but it is helpful to include a keyword in the domain. 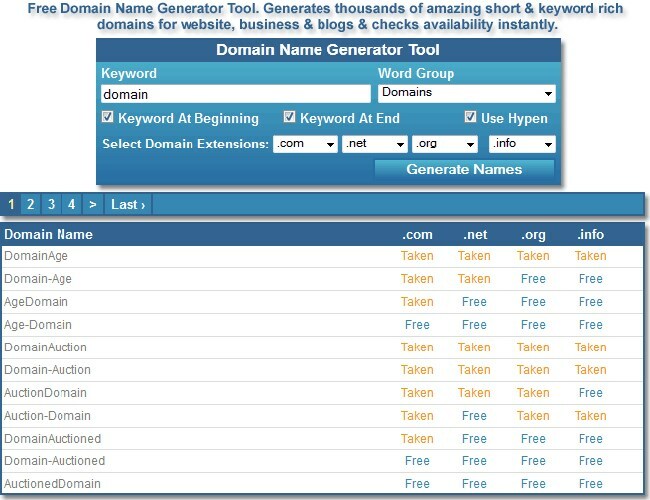 Now all you have to do is put in your keyword into the domain name generator tool then select an appropriate word group for your domain and hit the 'Generate Names' button. Generator will give you a list of suitable also brandable names with your keyword in it. Even tool will check availability of domain names within a moment. Isn't that easier and you just gotten yourself a dozens of available domain name ideas without even thinking! Even NameStall has an easier solution for those who don't feel like selecting a word group or don't know which word group to select for website names. Just try our unique domain name suggestions application where you just have to write your keyword and hit the 'Generate Names' button. Now our online domain suggestion tool will suggest you names in five different categories (two words, three words, numbers, hyphens as well as brandable) and will check availability instantly. 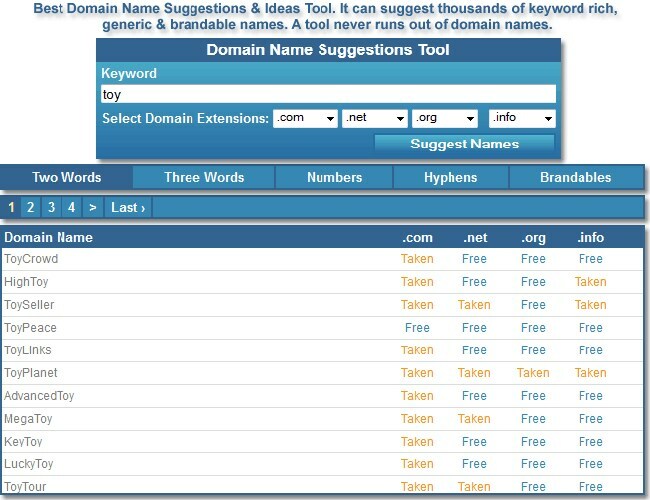 If you found that the name you like is taken, then it is highly recommended to use the domain name suggestion or generator tool to help you with domain name ideas. It can save you time also you may even discover a gem that you would never have thought of. So, if you plan to launch your website quickly with a proper and cool domain name, then go and head for our free domain name generator or suggestion tool for a list of available domain names to start with. It generates thousands of keyword rich names for your websites or businesses using your preferred word groups, prefixes or suffixes and you can select your word group, prefix or suffix from more than 180 word groups. This is a unique and one of a kind tool. Automatically recommends and suggests thousands of amazing and magnificent two words, three words as well as brand able names in five different domain name categories or types. 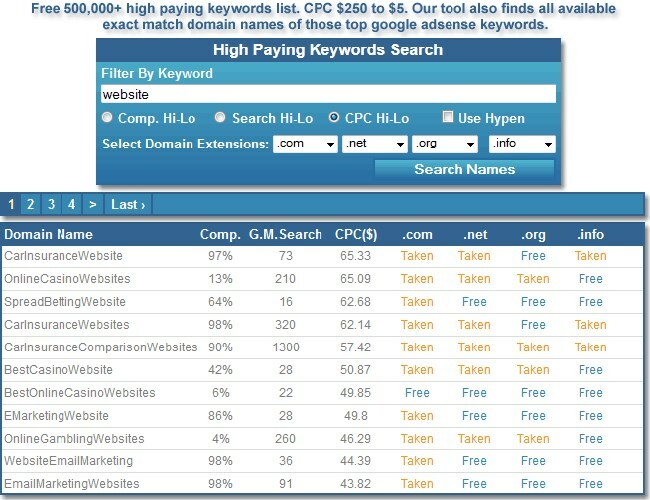 This tool creates short and cool keyword rich brand names or brand able domains. It supports more than 8 different languages' prefixes and suffixes including English, Spanish, French, German, Italian, Polish, Portuguese and Romanian. It is another very unique and helpful tool. It finds all highest paying Google adsense keywords and checks domain name availability for those keywords in multiple TLDs. It has a built-in 500,000 high paying keywords database. Exclusively developed for domainers to search dictionaries' words and find all available and unregistered dictionary words or one word domain names. This amazing domain tool supports more than 25 different languages' dictionaries. 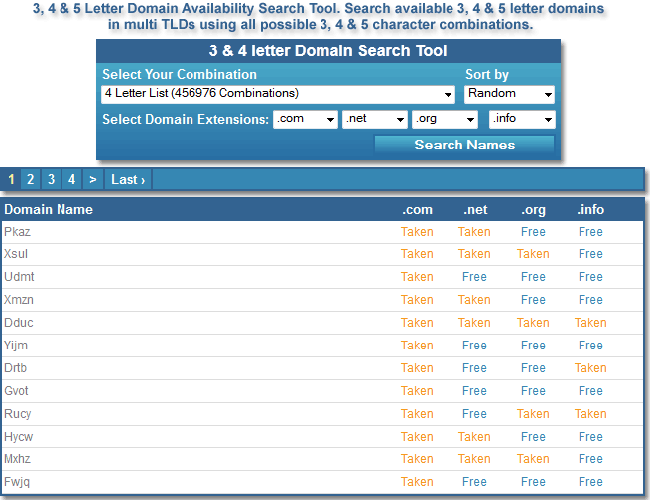 Another very special web application for domainers to find all unregistered or available 3 and 4 letter or character domain names in multiple extensions using all possible 3 and 4 letter as well as number combinations and permutations. This interesting web application can now create domain names like deli.cio.us or blo.gs and check availability immediately. It checks more than 1200 cctlds to find all possible domain hack within a moment. A very innovative tool to create exciting, interesting and memorable rhyming names for your websites or blogs or businesses. It supports more than 25 different languages' dictionaries including English, French, Spanish, German and more. This awesome tool checks domain name availability instantly while you type a word or domain name. Every time you add or type a letter to your keyword this tool will check availability of that keyword or name within a second. An advanced and better whois search script to discover and find who is the owner of a website or owner's email or contact detail and when the website or domain gets expired or deleted. Also provides information about Server, IP, DNS and more. If you want to search or check unlimited domain names availability in many different extensions at a time then this is the perfect tool for you. This web tool supports more than 60 TLDs and has no maximum input limit. This is the ultimate tool for those who can think creatively and come up with attractive names. This tool will spark your ideas and help your brainstorming process more creativity to find ultimate website or business names for your projects.